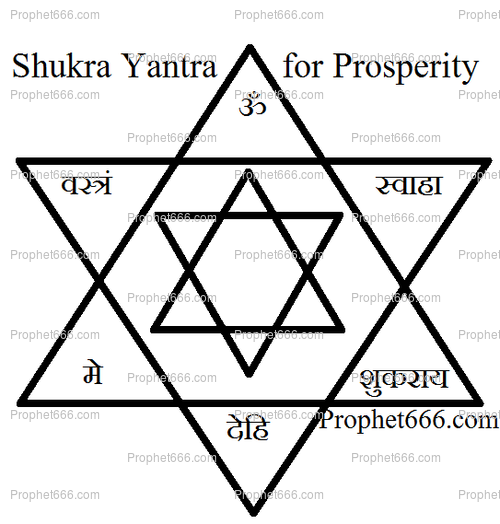 The Yantra-Mantra Experiment, described in this post, is to attract the auspicious energies of Shukra. This experiment is most suitable for those people facing financial problems, lack of material wealth, lack of domestic happiness and a dissatisfied love life. It is also suitable for the followers of astrology who have been diagnosed to have a weak, dull or malefic Venus in their horoscopes. Hindu as well as Western Astrology attributes Venus or Shukra as being the Planet, which bestows the pleasures of live, material as well as mental. Material pleasures, includes money, wealth, precious metals, gems and jewelry and luxurious items. Mental pleasures, include a great love, married or social life. The chances of marriage, contended physical relations with lover or wife and freedom from diseases and disorders are also some other qualities, which astrology attributes to Venus. The experiment is straight forward, you can make the Yantra on any Friday on Silver or Sandalwood. The prepared Yantra should be worshiped with offerings of scented flowers, Attar, Agarbatti and Pure Ghee Diya. Then, the Shukra Mantra shown below should be chanted 16,000 times within a period of Seven days, after worshiping the Yantra each day in the manner described above. A Sphatik Japa Mala is best suited to count the number of Mantra Chants. Then, the Yantra should be placed in the Place of Worship, Altar or any other clean place in the home. Can we draw the yantra with a pen on sandal wood. 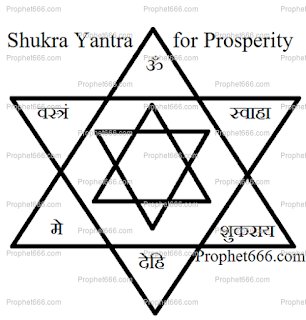 Hi Sir, how do we make this yantra? Post is confusing.